One-line summary: Oh, come on. You've heard of Sailor Moon. This morning, I took in the same story three times. It's the start of Sailor Moon. I read chapter one of Naoko Takeuchi's manga and watched its two anime equivalents, from 1992 and 2014. So far I think Sailor Moon Crystal (the 2014 remake) is a weaker show than its world-famous predecessor, but superior in its production values and characterisation of the supporting cast. Well, that's my opinion based on ep.1, anyway. I'll be reporting back later. This remake was originally meant for the franchise's 20th anniversary, but the dates slipped. The idea was to make something more faithful to the manga. That's a good reason to remake something, albeit here there's the wrinkle of the manga not being the original version of Sailor Moon. There isn't one. The manga and the 1990s anime were developed together, with neither being an adaptation of the other. However that doesn't really matter and I can respect this 2014 episode for setting out to adhere more faithfully to Naoko Takeuchi's version. They're all basically the same, mind you. All three hit the same beats, share most of the same dialogue and so on. However the 2014 episode is almost exactly the same as the manga, whereas the 1992 one is connected a little more loosely. First problem: that's not always a good thing. Sometimes the 1992 episode's changes were improvements. In 1992, Usagi has to get angry at some small boys who'd been bullying Luna. She chases them off and rescues the cat. This is clearly an improvement on randomly meeting her on the sidewalk, if only since it means we don't need an explanation of the plasters. We saw the boys putting them on Luna's forehead. Abracadabra. No need to explain it in dialogue. The 2014 episode, though, steers clear of all that. Usagi just sees Luna and picks her up. It's a bit rubbish, but that's what's in the manga. (a) The production values. The 1992 series looks cheap, especially in the climactic fight scene. In 2014, it looks like a fight! It's not all done with shortcuts and still frames! When Usagi throws her Death Tiara, the animation actually makes this look like a human throwing something. In 1992, in contrast, the tiara appears to levitate off Usagi's hand and zoom in on the baddie by itself, like a heat-seeking missile, thus giving the impression that Usagi hadn't done anything at all. It's a good-looking episode. The artwork is elegant rather than crude, the director is looking for dynamic camera angles and it doesn't feel like a kiddie cartoon. (b) The supporting cast, who shockingly have been allowed characterisation. The 1992 episode was all about Usagi. Every scene was focused on her and every character only existed as a foil for our goofball heroine. The 2014 episode, though, has kept conversational scenes in which Usagi's friends come alive as people in their own right. Throwaway dialogue gives us a glimpse into characters like Naru. This is a startling departure for anyone who'd only known the 1990s anime. In particular it's revolutionary for Tuxedo Mask, who'd been an annoying deus ex machina in 1992 and I remember it took entire seasons for the character not to need beating to death with cudgels. Here, he's good. He gets dialogue when Usagi's not around! He does things! He's still mysterious, but at least that means he's come alive enough for us to be wondering about his motivations. This is the biggest 2014 improvement. I liked Tuxedo Mask. Unbelievable. (a) This is the main one. This is the reason why the 1992 series became a world-conquering mega-franchise, while no one really seemed to like the 2014 series much and it looks likely to disappear without trace. The 1992 episode is brilliantly clear about its dramatic purpose. Every shot and every line of dialogue is there for a reason... which is to make Usagi look like an idiot. She's a goofball. She throws tantrums, she's pathetic and she bawls like a three-year-old, although she also has a good heart. Her uselessness in the fight scene at the end is hysterical. 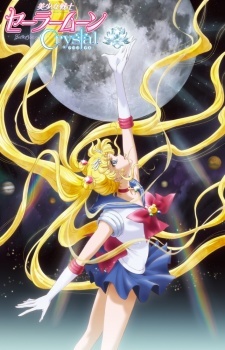 For a more detailed example, look at the beginning of the episode, which takes about three seconds to establish in half a dozen ways that Usagi is a hopeless case. We know she's late for school even before the dialogue says so. All three versions have practically the same script, but the 1992 episode is making it rock. Its Usagi is fantastic. She's one of the most vivid protagonists you'll ever see in anything. That's the Usagi who carried 200 episodes and made them awesome, despite the fact that 180 of them were wafer-thin copies of each other. 2014's Usagi, on the other hand, is elegant. She looks older than her years. This Usagi already has her eye on a boy, for instance, which I think might have been almost disturbing from her infantile predecessor. The show's almost making her seem more normal. She's mature in the jewellery shop scene, for instance. Everyone else is going berserk and the shop's become a meat market, yet Usagi walks out calmly, accepting that she shouldn't be obsessing about jewels. Usagi, mature! It sort of hurts to write that. Of course she is still a goofball. It's in the script. She gets told off by teachers and so on, even if the camera has a habit of cutting away so that we don't see it happen, but just hear it. Nonetheless her reactions are often being made to seem reasonable under the circumstances (e.g. a talking cat), whereas in 1992 the same beats were being played for outrageousness. Even the art style's getting in on it. She looks beautiful and is drawn more realistically, never pulling the exaggerated faces that you'll see in 1992 and, please note, also in the manga. That's a critical difference of tone, I think. Lesser differences include the start of the episode being nothing but a choir of angels on the soundtrack as the camera stares at the moon. (Sailor Moon, remember?) This lasts for nearly two minutes. It's portentous and arty, foreshadowing Usagi's destiny and reminding us that she's a world-redeeming heroine (rather than, say, a spaz). See also "the princess in my dream was so beautiful" and, in a different way, all the mentions of Sailor V.
(b) The production values. They're worse. This is better. Obviously 2014's elegant artwork is far better as art (e.g. the gorgeous eye-catches), but 1992's artwork served the story more forcefully. "Prettier" isn't always better. Usagi's mum looked more striking and had more presence in 1992, for instance. Even the fight scene's shoddiness is a significant element, because it's making Usagi look even more useless. The 1992 version has more personality. Look at the theme songs. The 2014 theme is perfectly good and I quite like it, but it's generic. I can't see it ever being iconic, unlike its predecessor. (You could argue that Moonlight Densetsu only gained its iconic status through sheer repetition, but I think the song's clearly more memorable even if it's not even necessarily that great a song. It's both girly and bombastic.) Alternatively, look at Usagi's transformation sequence. 1992's transformation sequence is way cooler, especially the music, and yet the 2014 sequence is basically the same, but more lavishly animated. 2014's sequence is so eager to show off that it's essentially an exercise in "Look at my amazing spinning camera angles". In 1992, you're flabbergasted by Usagi's cool transformation. In 2014, you're impressed by the animation quality. I don't mind them changing the voice cast. They've brought back Kotono Mitsuishi as Usagi (although at times she's almost having to play against what's on screen) and I can respect that. Everyone else has been replaced, but reuniting all those now-famous names would have been a budget-buster. The horror stuff is good in both versions. 2014 has nothing as awesome as the 1992 Exorcist head-spinning, but Morga's manga look is still okay (if less memorable) and the zombies are better. In short, the 1992 version kicks the 2014 version's arse. In their grasp of dynamic storytelling, it's like watching professional vs. amateurs. Every beat in every scene has more punch. It wastes zero time. It's always getting on with the next gag or character beat. It cuts all dead air. It has a stronger sense of the purpose of scenes and of how to get the most from all of its dramatic beats. Obviously it's all about Usagi, but it's not as simple as the 1992 version being more daffy and scatterbrained. She gets angrier too and has stronger emotional reactions generally. She's a more vivid character. The joke of Usagi's crying being a sonic attack is funnier, for instance, because this isn't her first bawling fit and so we understand that it's an Usagi thing. 2014 sets up Usagi's fighting abilities (at the game centre). 1992 sets up Usagi's no-fighting abilities. Nonetheless it's genuinely startling for the supporting cast to exist as characters in their own right, instead of just being entities for Usagi to bounce off. That impressed me. Tuxedo Mask in particular blew my mind. The battle scene being animated properly makes a huge difference too. This isn't a bad show at all, I think. It's decent. I find it an interesting remake, partly due to the counter-intuitive nature of some of its changes, and I'm looking forward to the rest of it.